For the study, more than 700 men and women from Finland and Taiwan were shown two silhouettes of bodies alongside emotionally charged words, stories, movies, or facial expressions. They were asked to mark in the bodily regions on the silhouettes where they felt a physical sensation response to each emotional image. What did the researchers find? 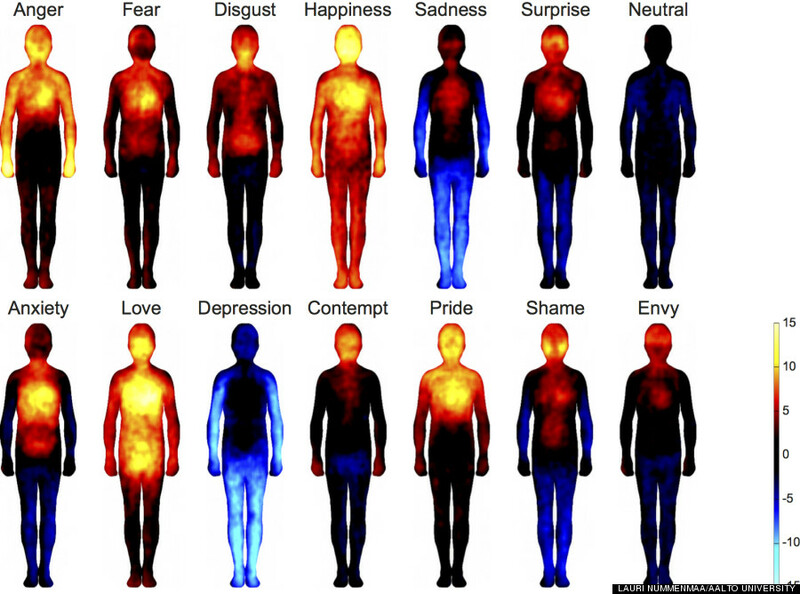 The resulting body maps revealed that most people had similar physical sensations in response to each emotional state. As fascinating as the maps are, some critics warn that using these subjective self reports may be misleading. Dr. Paul Zak, chairman of the Center for Neuroeconomics Studies at Claremont Graduate University in California, told HealthDay that “areas in the brain that process emotions tend to be largely outside of our conscious awareness,” and some people often feel more than one emotion at a time. Still, the new research may shed light on the functions of emotions and their biological basis, as well as different emotional disorders, Nummenmaa said. “Many mental disorders are associated with altered functioning of the emotional system, so unraveling how emotions coordinate with the minds and bodies of healthy individuals is important for developing treatments for such disorders,” Nummenmaa told HealthDay. The study published online Dec. 30. 2013 in the journal Proceedings of The National Academy of Sciences.